OwnerHarold JamesVehicle’63 Chevy Impala SSCity/StateFairfield, CaliforniaClubForever Low C.C. Harold’s ’63 Super Sport was featured years ago in Lowrider and enjoyed its moment in the spotlight. Now once you’ve been featured, you can either put your ride away and start over or you can do what Harold did and that’s keep adding to it. Sometimes, this will change things up enough to satisfy the urge of redoing your ride. Harold wanted to build something unique so he paid a visit to Chris at C&C Customs in Vacaville, California, who took on the task of creating a custom trunk. Chris’s first job was to tear out the old setup and completely start over by building a platform to act as a foundation for the four custom pumps that would be going in. The rest just flowed as Chris and his crew designed four pumps that were dressed with four original Adel square dumps, and four Parker slow-downs to control the flow of the hydraulic fluid that runs through the setup. A custom manifold distributes even flow to the front and rear pumps. The custom parts were then removed, polished and chrome plated. Once everything was back, the setup was tubed in stainless steel. Chris then pressurized the setup and made certain that everything was working properly. ABC Upholstery, who had originally done the interior of the car, took on the task of wrapping the panels and giving the trunk that finished look. The result of the two-month project was a trunk setup that has it all-a sound system and a custom setup that gives Harold’s ride new life (until he decides to add some more to his already finished low-low). Good luck, Harold, and we hope to see you in our pages again in the near future. As you all know, Harold will have added even more to his ride by the time that this layout hits the newsstands. BumpsOwnerAaron HodgesonVehicle’57 Chevy Bel AirCity/StateOxnard, CaliforniaClubConnected C.C. Aaron had a street car in mind when he began this ’57 Bel Air project. 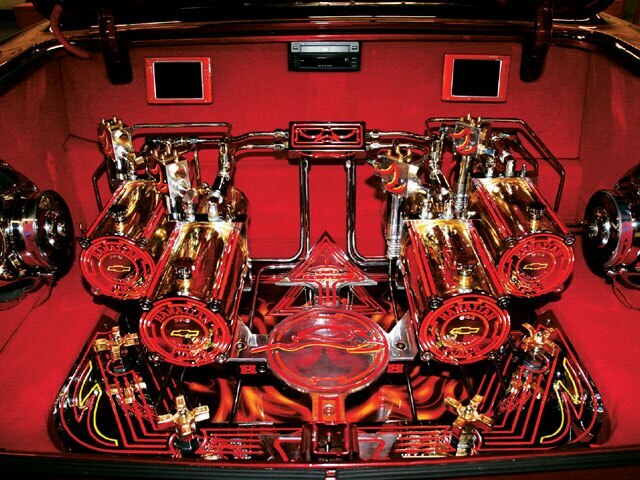 He had already built a custom Chevy Blazer that was featured as Lowrider of the Month five years ago. This time around, Aaron decided to build himself a street car that would feature a very clean sound system. His plan was to build a car that he could just jump into and go, whether it be to a picnic (which is where we spotted the ’57) or just for a Saturday night cruise. 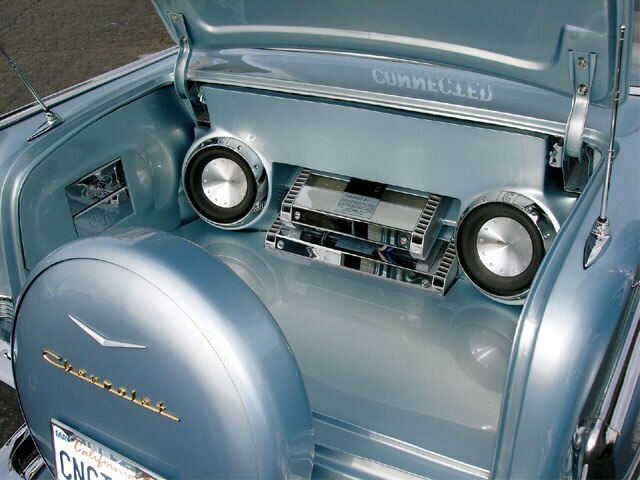 This Bel Air features a full Rockford Fosgate sound system that was installed by Mario Escamilla and Manny Aguilera. The system’s powered by two amplifiers split for the bass and the midrange speakers. One of the amplifiers was tuned for the separates or Fosgate components, and the second amplifier serves as the “soul” of the two 12-inch competition woofers that are enclosed in custom speaker boxes. The custom panels were prepped and painted by Albert Bustillos and Robby Jimenez. The panels were a perfect match to the exterior of the car. The amplifiers were also taken apart and painted, and custom badges were created. The woofers also received the subtle initial “C” for Connected Car Club. This two-year build turned out great as the ride has more than just a custom trunk. The rest of the car is done very tastefully as well. We’re sure that this will not be last that you’ll see of Aaron’s Bel Air. The car might even be featured in an upcoming issue of Lowrider. Until then, keep up the good work.